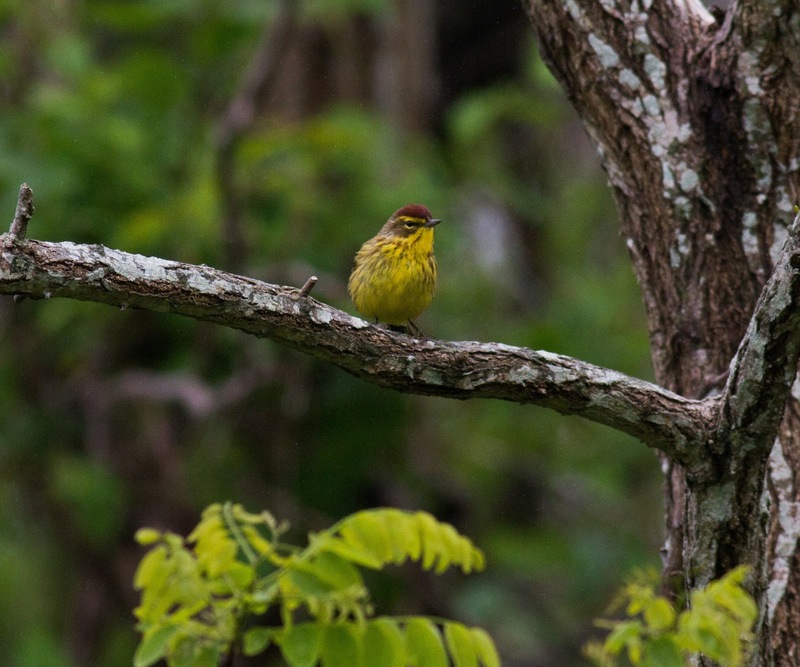 The 33rd Annual World Series of Birding is right around the corner! Am I tired? You bet. Am I excited? **** Yes! This game isn't just about the 24 hours of the main event; it's everything: the months of planning, the appeals to prospective donors (thank you! thank you! thank you! ), and the exhilaration of seeing so many faces, both familiar and new, of the birders who make their way to New Jersey for the biggest birding fundraiser of the year. This spring has been different, though. The weather hasn't been good. It has been amazing! 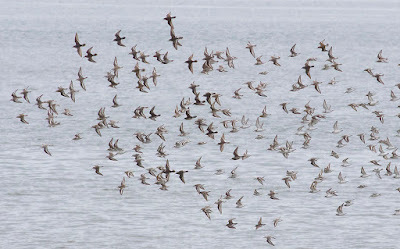 Low pressure over New Jersey has set up shop, and as a result strong westerly flow has affected birds migrating over the carolinas and Virginia, while light and variable winds over southern New Jersey have either had no effect, or put birds down statewide. This perfect storm of wind vectors and the addition of precipitation has lead to some of the most amazing fallouts of birds I've ever seen in spring Cape May! But what about on Game Day? What does the weather look like? The weather forecasts leading up to the weekend have been poor at best. That said, if the forecast is moderately accurate going forward, there are a few points that seem safe to make. The first one is not weather-forecast related at all, really...but it's important! There are lots of birds currently on the playing field. I mean L O T S of birds. 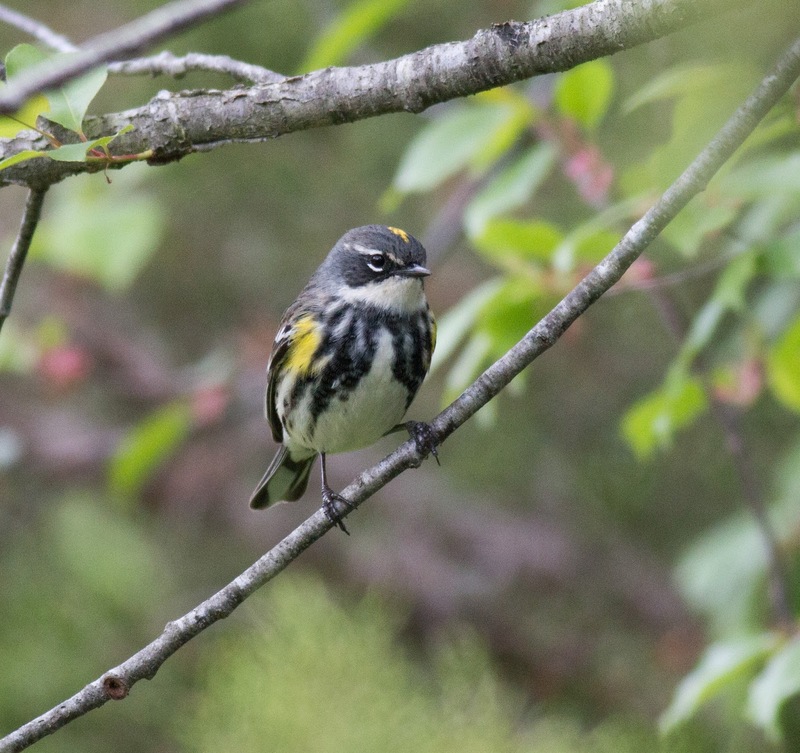 Over 30 species of warbler have been tallied in Cape May County over the last 48 hours and the last big wave of boreal songbirds (Cape May Warbler, Bay-breasted Warbler, etc.) have been hitting central and northern NJ yesterday and presumably today. 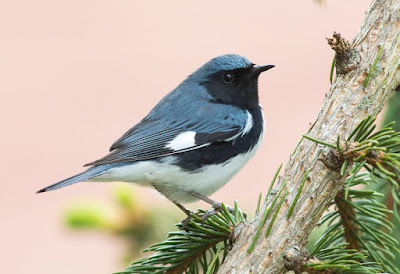 Flycatchers have been hitting southern NJ over the last week but empids (other than Acadian) are scarce thus far (as I type this, the first Eastern Wood-Peewee sang outside the window; clearly a new arrival this morning). Friday and Saturday will experience precipitation across the state as a series of cold fronts move through on both days. The timing of these fronts so far looks like they will convey birds up into the playing field during both Friday and Saturday nights, and the combination of precipitation and migration will mean birds being grounded throughout the area. Wind will build on Saturday which will be a consideration for both listening for birds, and finding them in exposed areas. Plan your route accordingly for nocturnal flight call listening on Friday night, and sheltered listening on Saturday night. This year promises to be a great one for those teams who can roll with the unpredictable weather! Accumulated Precipitation Forecast for the Mid-Atlantic region from Thursday through Sunday AM. Note the two fronts moving through the region during Friday and Saturday. Surface wind forecast for the region from Friday through Sunday AM. Winds aloft forecast for the region from Friday through Sunday AM. So as you can see, the weather for the 33rd Annual World Series of Birding is interesting, to say the least. In preparation for the Big Day, please try and have at least one member from your team attend the swap meet. This will ensure you have the most up-to-date scouting reports. For the South, the Swap Meet will be held at 6:30pm at the Center for Research and Education, 600 Route 47 North, Cape May Court House, NJ 08212. Why is Cape May so full of birds? That's the question on everyone's mind. 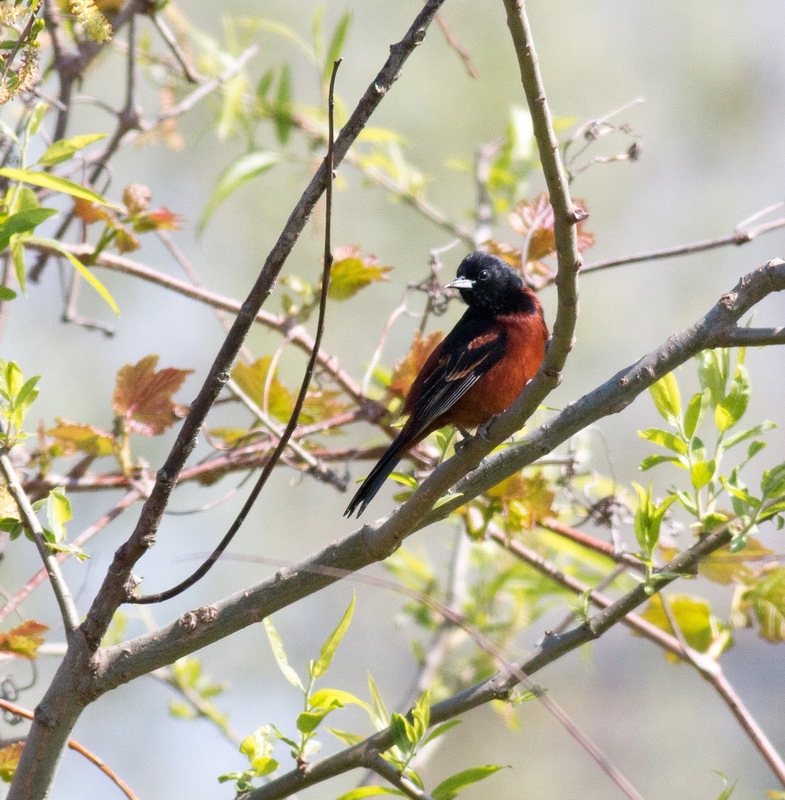 Yes, Cape May is mecca for birds and birders, but spring in Cape May is typically fast and furious for songbirds, with new waves coming on the heels of the last and fallout conditions not nearly as common as those in fall. So what's going on this year, where birds are both diverse and absolutely abundant throughout the Cape May region? 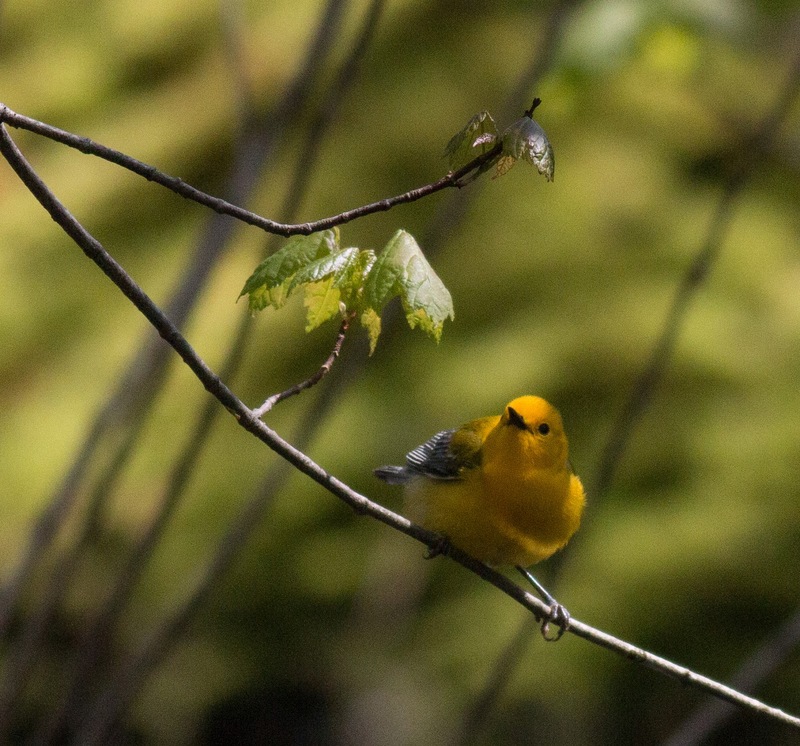 Over 30 species of warbler have been seen during the last three days, oodles of Grosbeaks, Tanagers, Orioles, Buntings, and Sparrows are flushing from underfoot for anyone willing to brave to wet cool conditions at Higbee Beach WMA. 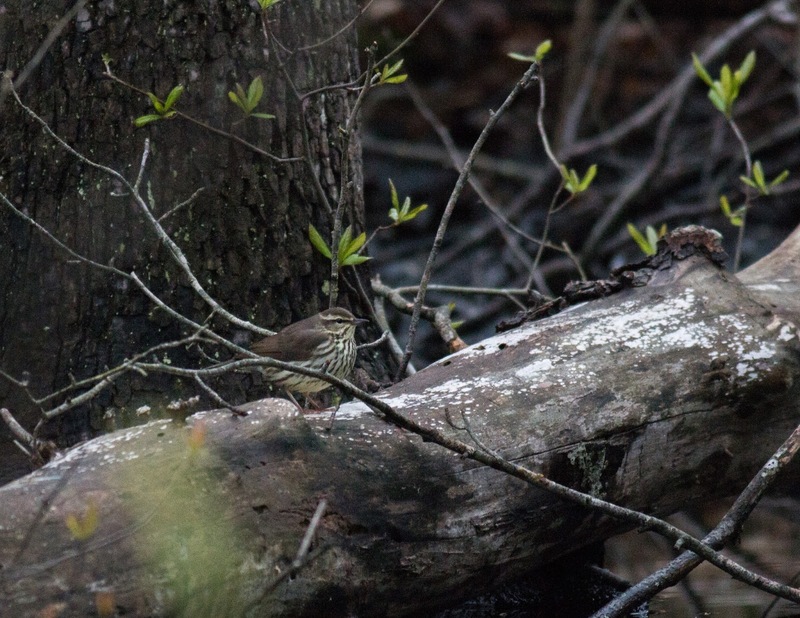 The streets of Cape May Point have been host to over five species of thrush with the most numerous being Veery and Wood Thrush, aside from our ubiquitous Turdus migratorious (the glorious American Robin). 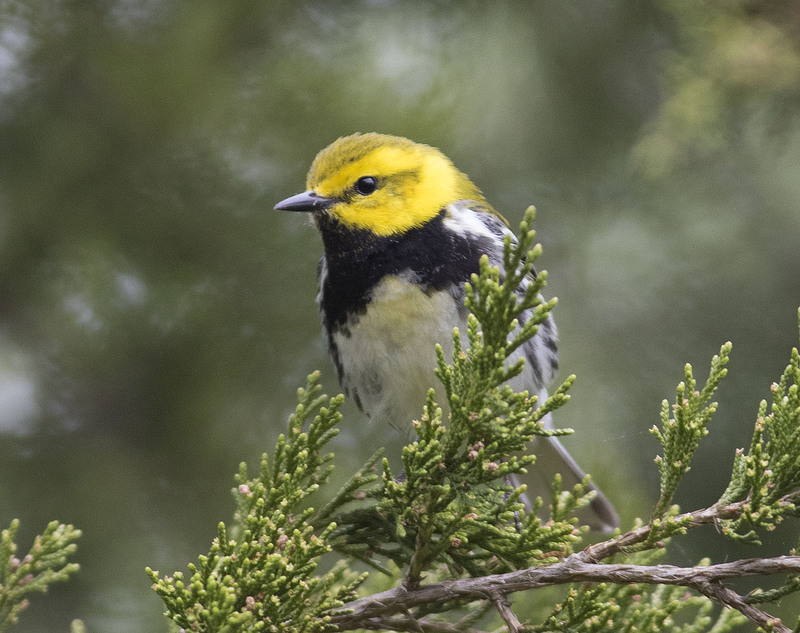 So, what do we attribute this all-out-fall-out of spring migrants? The weather, of course. It all started on the evening of May 1, when strong southwesterly flow over Virginia and the Carolinas shunted the leading edge of a major migration to the east coast, specifically the Delmarva and Cape May Peninsulas. The Delmarva received the lion's share of the birds, but Cape May has the added benefit of being a small bit of land in comparison, which magnifies the impact of a wave of new arrivals proportionally. Here is the radar from May 1 to May 2nd, showing the strong flow of birds from the southwest to northeast. So from the videos above show strong southwesterly flow pushing the birds over the Delmarva and up to Cape May. What you can't see is the absolutely massive migration of birds from the south, over Virginia and the carolinas, that are feeding this wave of birds. Below is the radar from the next night into the following morning (May 2nd to 3rd) where more of the birds from the south were again pushed up into the Delmarva, and more of the Delmarva birds moved up into New Jersey. 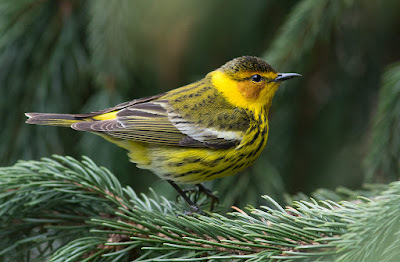 The videos above show another wave of migrants hitting the east coast, mixed with some heavy precipitation which both limited the distance (although density remained very high under the precipitation) of bird migration, resulting in more concentration at Cape May and little birds leaving the region. The next two nights we saw little to no migration over our region resulting in only local movements of birds into better habitat. 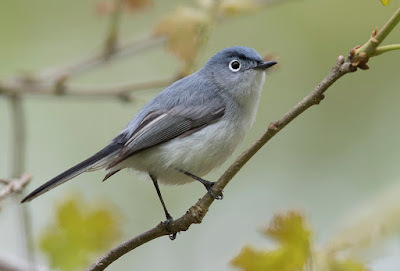 The result on the ground has been excellent birding at all the hotspots, especially the Higbee Beach WMA, The Rea Farm (Beanery), Cox Hall Creek WMA, and The Nature Conservancy's Cape May Meadows. 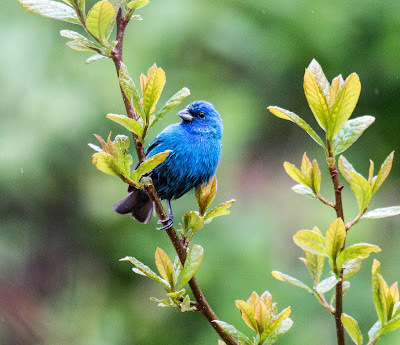 The woods around the Cape May Bird Observatory's Northwood Center has been absolutely flooded with Rose-breasted Grosbeaks (up to 12 at once), a number of Blue Grosbeaks, dozens of Indigo Buntings, and a smattering of warblers and vireos. 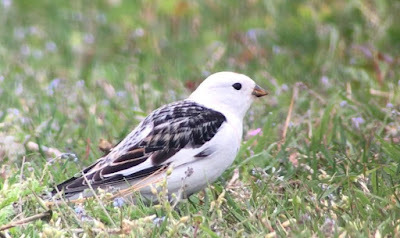 One of the most unexpected finds, though, was this stunning Snow Bunting originally found by Rod MacKenzie in the afternoon of May 4th, and still showing very well at Cape May Point State Park as of this afternoon! Here is a photo by local ornithologist Michael Lanzone. Mike also noted that a Snow Bunting looking very much like the same individual was sighted at the south end of Cape Hatteras on May 2nd! So, what does the future hold? Well, if you believe the weather forecast (which this author does!) it's looking like we should see more birds coming to Cape May over the next week! Over the weekend the weather should keep most of these birds around, but early next week we will see the arrival of another low pressure system with a nice southwesterly flow to our south, and west/northwest flow to our north. 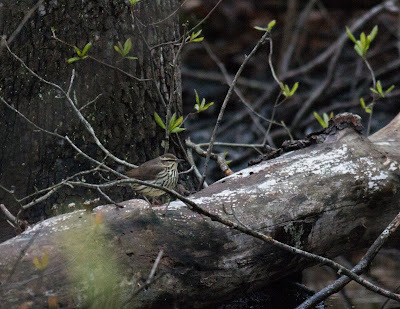 That combination makes for great birding in Cape May, and is actually more the exception than the rule in a typical spring...but this is no typical spring! We've got a few big things coming up over the next few weeks you should be aware of. First is the 33rd Annual World Series of Birding (http://worldseriesofbirding.org) a 24-hour bird-a-thon fundraiser where over 200 species are routinely tallied each year across New Jersey. 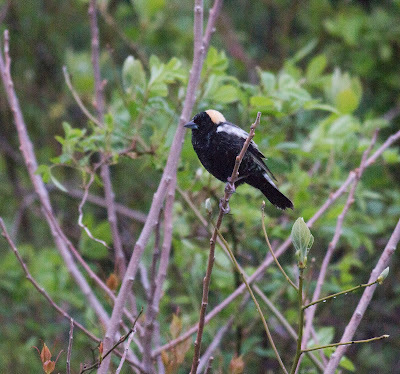 Cape Island alone usually sports a cumulative list of over 200 species and I expect given the way this spring is going, this will be a year for the record books! And of course you can find out everything going on here in Cape May within the pages of our Kestrel Express quarterly publication, downloadable by clicking here. So from all of us at CMBO, we hope to see you here soon!